The Property Management Bootcamp either the basic or advanced course is a required course for everyone. Property Managers with less than 2 years of property management experience are required to take the basic bootcamp (Will the Real Property Manager Please Stand Up). Property Managers with more than 2 years experience can take either the basic or the advanced bootcamp. To earn the certification, students must complete all the required curriculum within three years of the first course taken. The first official CRPM course was offered in August 2015. Topics covered in this program include: property management bootcamp, accounting, contracts, agency, fair housing, agency, ethics, legal, disclosure, plus one elective course. All classes are approved for c/e credit and 3 hours in length with the exception of the 6 hour Property Management Bootcamps. Courses can be taken in any order. Re-Certification: Attend a free webinar annually. Webinar will be posted every January 1 and must be viewed prior to March 31 of each year. There are no certification or recertification dues. 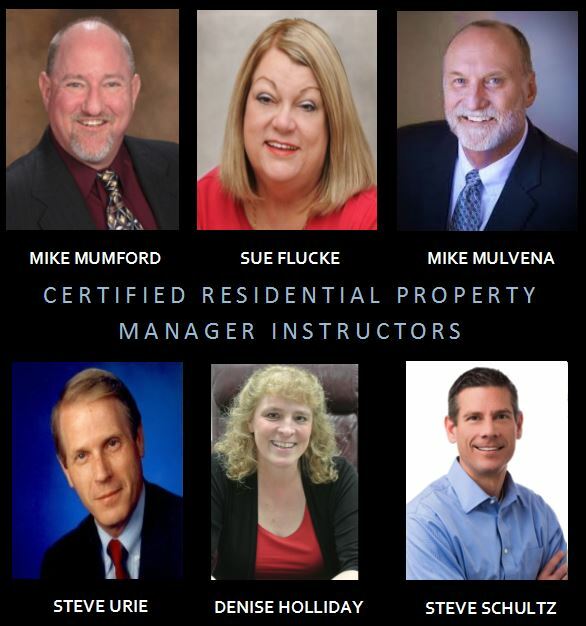 CRPM Instructors: Mike Mumford, Sue Flucke, Mike Mulvena, Steve Urie, Denise Holliday and Steve Schultz.